The 84,000-square-foot center is currently under construction. It will feature 20 laboratories as well as shared support spaces and specialized equipment areas for scientific research in bioenergy, water quality, food safety, genomics, information science and ecosystem health. 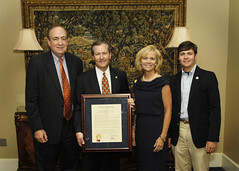 Researchers from Auburn’s colleges of Agriculture; Engineering; Sciences and Mathematics; and Architecture, Design and Construction; and its School of Forestry and Wildlife Sciences will be housed in the facility. The center, which is expected to have an immediate economic impact in Alabama by creating jobs for its actual construction, has the potential when completed to bring in millions of dollars in grants and contracts annually, which can result in 10 times that amount in amplified economic impact per year.